I've been to a Catholic Church very few times in my adult life. It's a very different experience than the protestant Churches I'm used to. 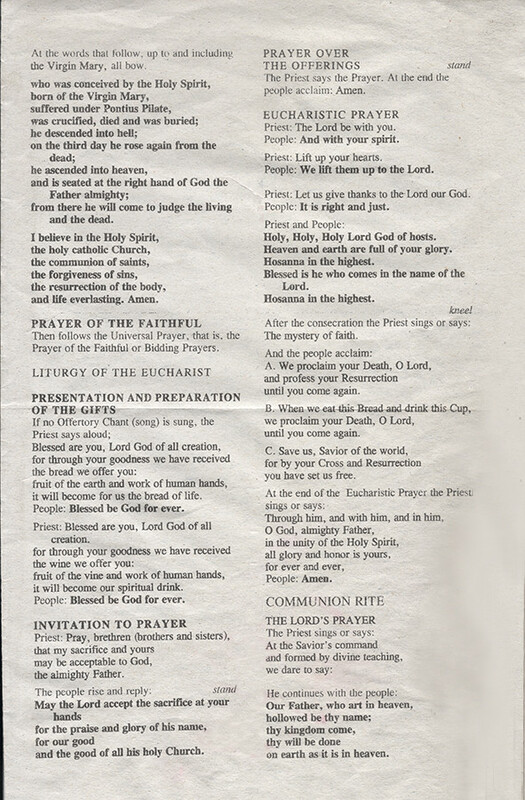 In most of the Protestant Churches, there is generally a time of singing/praise/worship, followed by some general announcements for members (The Lady's Missionary meeting will be meeting on Monday night at Liz's house, for example), followed by a prayer, then a sermon on a particular topic, more singing, and a prayer. In most Baptist Churches, there's an altar call just before the final prayer. The Catholic Church also seems to have a very set format, and it doesn't seem to vary much, but that's probably an outsider's perception. I'm interested to know what the standard format it, and also, what things are the same every week, and were there is variation. To give an example, in all the activities in the Protestant Churches I described, each and every one of those activities vary. The sermon is different every week. 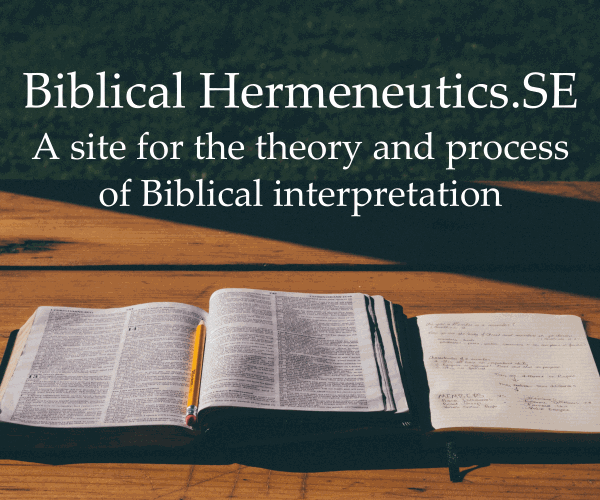 The Hymns vary (in our Church they are chosen because the doctrine in the Hymn is directly relevant to the sermon message) The format stays the same, but the contents seem different. In the Catholic Church, however, it seems to be much less flexible. I do not mean this to be disrespectful, but it seems that everyone knows when to stand, when to kneel, when to sit, and there's usually a time when the Priest says one thing and everyone else responds in unison. ("Peace be with you" - "and also with you" being the easiest to remember.) I get the impression that this part of the service is the same week after week. Or if I'm just perceiving things incorrectly, correct my misunderstanding. E. Eruption of noise as everyone suddenly forgets they're still in the presence of The Lord. That's about the gist of it, the order of mass is what is supposed to happen, some things that aren't supposed to happen are pretty normal ( or at least regional) if you want to see how it's supposed to be done head over to the Guadalupe Shrine outside of La Crosse. I got this manual from my sibling's homework for their subject, Christian Living Formation. Hope this helps. 1. The Order of Mass. St. John Bosco Parish Church. 20 August 2010. Web. 5 February 2012. 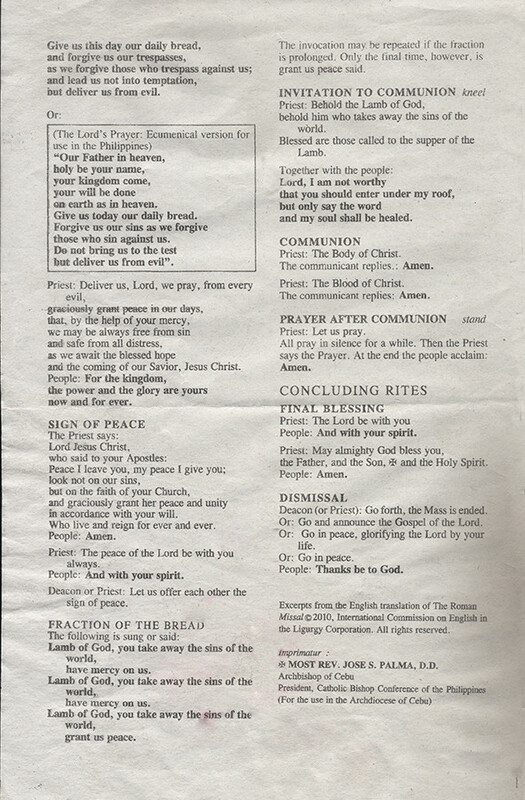 <http://www.saginaw.org/images/stories/PDFs/missal/order-of-mass.pdf>. 2. The Order of Mass. Catholic Diocese of Saginaw. 10 June 2012. Web. 5 February 2012. <http://sjbmakati.com/uploads/2/7/4/3/2743634/new_roman_missal.pdf>. Mass Ordinary: This set of texts remains more or less fixed from day to day, with some variation based on the season or the day's liturgical rank1 -- for example the Gloria is omitted in Lent and Advent, the second reading and Creed are generally omitted on weekdays, etc. Peter's answer outlines its structure. 1Every day of the year has a liturgical rank, which ranges from Easter at the top to an ordinary summer weekday at the bottom, with saints' feast days somewhere in between depending on a number of factors. Generally mass is celebrated in a Catholic church every day, if a priest is available. Attendance at mass is required for Catholics on every Sunday, and Holy Day of Obligation (which vary by country), as previously answered. However, notwithstanding several important points, participation in the Eucharist (communion) is only required once a year. The order of mass is specified by the pope. 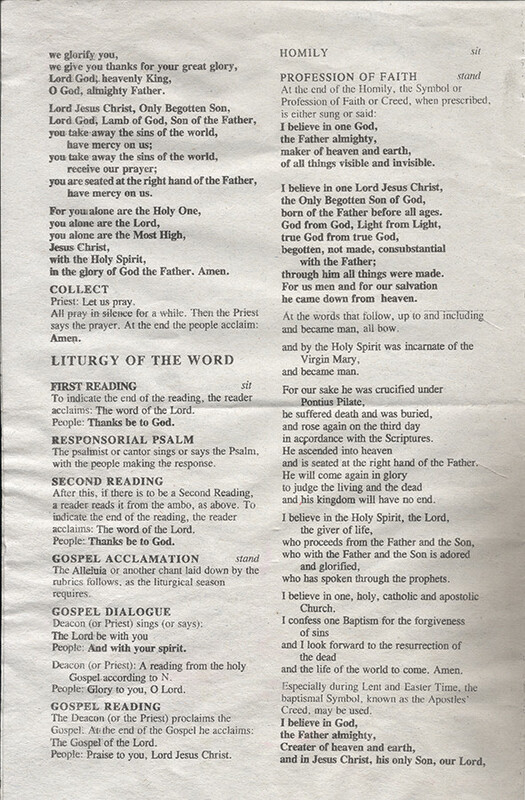 It is specified in the "General Instructions of the Roman Missal". A great deal of the structure, form, and specific words to be used are strictly prescribed. Some songs, and some customs are up to regional and local variation. 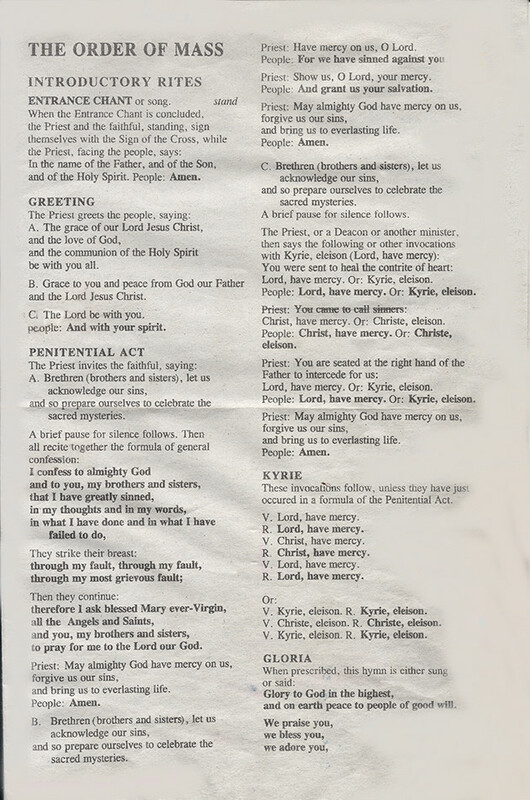 To be exhaustive, there are also other authorized rites that are somewhat different, particularly the traditional Latin mass. But generally, the mass is the same everywhere, and one should be able to follow along even if it's in a different language. To get back to the start of the question: yes, a Catholic mass is very different, and that's because protestants have decided that they have 20,000 better ways of worshiping God than the Church does. Why would a Spanish Catholic priest disapprove of German Catholic texts for Gloria and Sanctus?